By Allan Fox: WBA interim welterweight champion Keith Thurman (23-0, 21 KOs) is being talked about facing unbeaten 39-year-old EBU welterweight champion Leonard Bundu (31-0-2, 11 KOs) on the undercard of the December 13th fight card headlined by Amir Khan vs. Devon Alexander at the Mandalay Bay Resort & Casino, in Las Vegas, Nevada, USA. 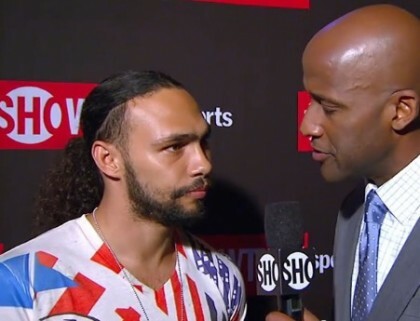 If Bundu does turn out to be Thurman’s next opponent, it’ll be a potentially difficult fight for Thurman. Bundu, 5’6 ½”, has a lot of power, and a difficult fighting style for someone coming off of a shoulder injury like Thurman. Bundu is coming off of a 12 round split decision win over the previously unbeaten Frankie Gavin from last August. Bundu knocked Gavin down with a left to the body in the 6th round. He might have been able to stop Gavin if he hadn’t fought so defensively. Roberto Garcia had been mentioned as a possible opponent for Thurman. It’s unclear what happened with that fight. It would have been a hard fight for Thurman because Garcia is a pressure fighter with an excellent chin and good power. Thurman last fought against Julio Diaz last April. Thurman knocked Diaz down in the 2nd round and hurt him with a body shot. Before that fight, Thurman defeated Jesus Soto-Karass by a 9th round knockout last December. Thurman recently said that he’s interested in fighting Amir Khan. However, it doesn’t appear that the interest is mutual, because Khan has been almost totally silent on the subject of him sharing the ring against Thurman. A fight between Khan and Thurman would be the ideal fight to determine an opponent for Mayweather in May, but it looks like Khan’s adviser/manager Al Haymon had other ideas. He chose to match Khan against Devon Alexander instead. That’s arguably an easier fight for Khan, but far from an easy one. Thurman is in a situation where he’s not going to get a big named opponent until he starts facing recognizable opponents.